Vasculitides refers to a heterogeneous group of disorders characterized by inflammation of blood vessels resulting in destruction and distortion of the layered components of their walls. The inflammation can result in clinical syndromes ranging from minor self-limiting illness to life-threatening systemic disorder. The categorization of vasculitides hinges on the sizes of the vessels affected, and excludes a direct infective etiology. The diagnosis, however, depends on the site and extent of vascular injury, which in turn is reflected by protean clinical and radiological manifestations, along with altered laboratory parameters. The Chapel Hill Consensus Conference Nomenclature of Vasculitides classification is still widely used and has been recently refined. For children and adolescents, the European League Against Rheumatism (EULAR) and the Pediatric Rheumatology European Society (PRES) endorsed a new classification which particularly addressed the problems of childhood vasculitides, and Takayasu arteritis (TA) is the only large vessel vasculitidis in this age group. The term "large-vessel vasculitis" (LVV) refers to chronic inflammation affecting the elastic arteries, mainly aorta and its major branches. In adults, this group also includes giant cell arteritis (rarely occurring before the age of 50 years) and TA (rarely occurring after the age of 50 years). TA forms the third most frequent vasculitis in childhood in the EULAR/PRES classification of vasculitis. TA is a chronic idiopathic and granulomatous vasculitis, manifesting mainly as a panaortitis. The inflammation commences from the adventitia and progresses to the intima and leads to, both in adults and children, segmental stenosis, occlusion, dilatation, and/or aneurysm formation. This review focuses briefly on the etiopathogenesis, and the pathological features in adults and children. The disease progression is said to occur in a triphasic pattern. Phase I is the systemic or pre-pulseless period, which is characterized by constitutional symptoms such as low-grade fever, malaise, night sweats, arthralgia, anorexia, and weight loss. Hence, TA should form a differential diagnosis for fever of unknown origin. Phase II is the vasculitic stage where constitutional symptoms are accompanied by features of vascular involvement like tenderness or pain over vessels (angiodynia). The final phase refers to the late, fibrotic, occlusive, quiescent, or "burnt-out" phase, wherein characteristic features of TA (pulseless disease) related to arterial stenosis or occlusion appear. Only a minority of patients show such a temporal progression. The active or acute phases of the disease, which are difficult to diagnose, remit spontaneously in about 3 months or may progress insidiously and relentlessly for months to years into the chronic phase. It is to be noted that inflammatory and fibrotic changes can co-exist. Around 5% of patients with TA are children and adolescents. Most children are diagnosed between ages 8 and 13 years, and like adults, females outnumber males with a ratio of 3:1. , The largest pediatric series of 70 patients was reported by Hong et al;  the youngest reported case was 7 months old. Early clinical diagnosis in children is even more challenging, TA should be considered in the differential diagnosis when they present with fever, vomiting, and weight loss; other symptoms include night sweats, back pain, mylagias, and arthralgias. This also simulates acute rheumatic fever, leading to misdiagnosis. In comparison to limb claudication, poor/absent peripheral pulses, or bruits, hypertension is not only the most common mode of presentation, but also very often the only manifestation of TA in children. 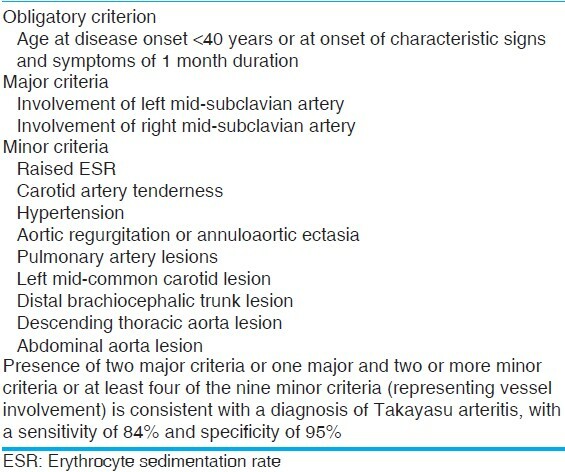 , Hence, modification of the diagnostic criteria for TA has been advocated [Table 3]. One-third of children present with inactive disease, in which clinical features represent vascular sequelae. Presentation with heart failure is also common. In TA, biopsy specimens are seldom available and hence morbid anatomic features are based on autopsy findings  or segments excised during bypass surgery. On histology, the lesions can be active, chronic, or healed. Though TA is a panarteritis, the initial site of inflammation is around the vasa vasora and at the medio-adventitial junction. There is edema, and mononuclear cell infiltration (CD4 and CD8 lymphocytes, plasma cells, and macrophages) in the outer thirds of the media and adventitia. Giant cell granulomatous reaction [Figure 1]a and laminar necrosis can also be present. Fragmentation of elastic fibers with "elasticophagia" is prominent. Rapid or more severe inflammation leads to loss of smooth muscle cells, medial weakening, vascular dilatation, and even aneurysm formation. There is reactive fibrosis and increased ground substance in the intima, with overlying layer of thrombus or a band of neo-vascularization at the intimo-medial junction. 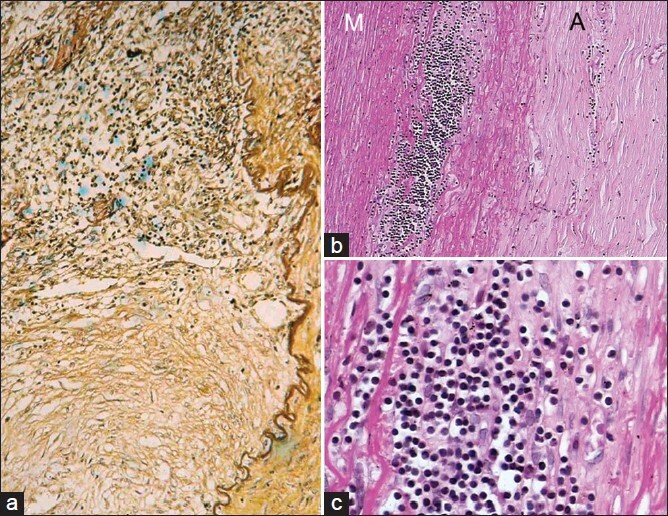 In the chronic phase [Figure 1]b and 1c, there is patchy mononuclear inflammatory infiltrate with medial scarring and vascularization, while the healed phase [Figure 2] shows only fibrosis in all layers; these two phases are often seen. Clinically, though aortic arch and renal arteries are often involved, at autopsy it is rare to find disease restricted to aorta and its branches. One or more patterns of disease are noted: (1) Localized aortic segment involvement for a length of 2-7 cm; (2) multiple short segment disease with normal or "skip" areas in between; or (3) diffuse aortic disease with or without a small stretch of normal segments in between. The disease may start at the aortic annulus, but by and large, the infra-renal aorta, inferior mesenteric artery, and iliac arteries are usually not affected. The disease is classified into five types on the basis of the pattern of anatomical involvement: Type I, aortic arch and its branches; Type II, descending thoracic and abdominal aorta; Type III, aortic arch and thoraco-abdominal aorta; Type IV, pulmonary artery in addition to the aforementioned types; and Type V, coronary artery in addition to the other types. Another classification  categorizes TA into six types: Type I, aortic arch and its branches; Type IIa, ascending aorta, arch, and its branches; Type IIb, ascending aorta, arch, and its branches, and descending thoracic aorta; Type III, thoracic aorta and abdominal aorta; Type IV, abdominal aorta; and Type V, combination of Type IIb and Type IV. Involvement of coronary arteries is labeled C (+) and involvement of pulmonary arteries is denoted as P (+). All patterns of vascular involvement are observed in all regions, though a distinct pattern is also seen. Japanese patients have a higher incidence of arch involvement (reverse coarctation), while in Southeast Asia, India, and Africa, it is the "middle aortic syndrome" with affection of thoraco-abdominal aorta and renal arteries; the pattern is often diffuse [Figure 3]. 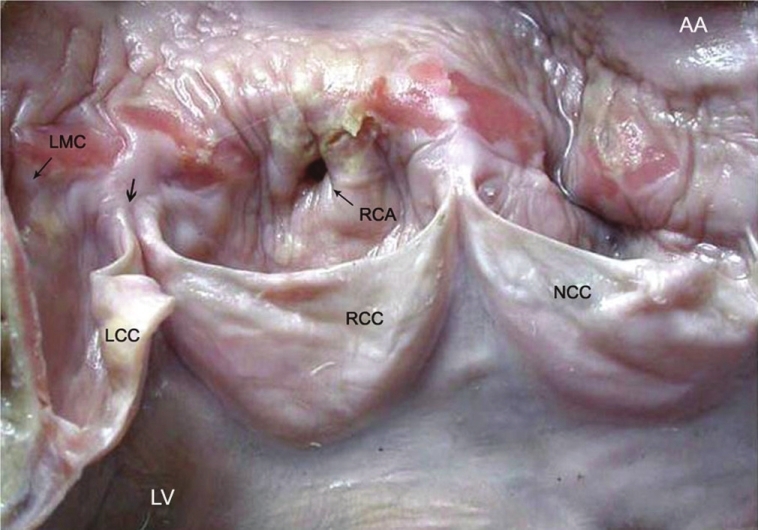 In North America, arch vessels and abdominal aorta are more frequently affected. The extent of the aortic disease is apparent on gross examination and it is best seen in children. The aorta feels stiff and rigid on palpation. The most striking feature is the extraordinary degree of adventitial and periadventitial fibrosis [Figure 3], which is in excess to that seen in any other inflammatory disorder of the aorta. This may produce adherence to the neighboring structures. In the early stages of the disease, the thickened adventitia may have a gelatinous appearance. Another feature is the presence of enlarged para-aortic lymph nodes, particularly in the vicinity of renal [Figure 3] and subclavian arteries. 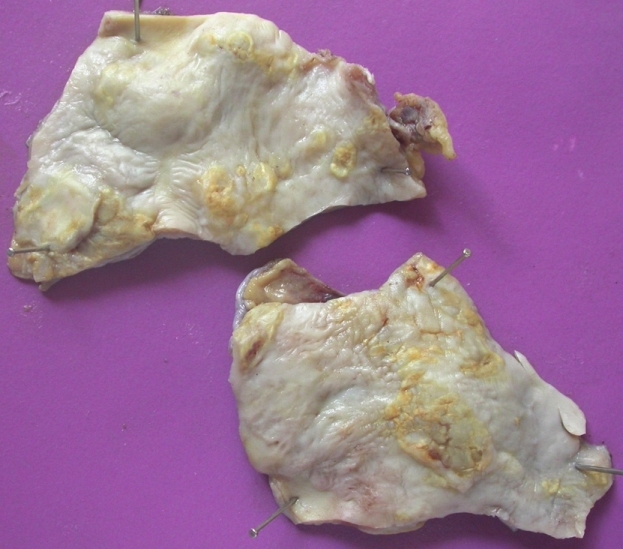 The nodes may show caseation necrosis or active hyperplasia. The intimal fibrocellular hyperplasia is seen as plaques, and depending on the amounts of acid mucopolysaccharides and collagen, it appears gelatinous or white, respectively. Gelatinous plaques are characteristically seen in children [Figure 4]a. Sometimes the plaques are large or even circumferential or may even be covered by mural thrombi [Figure 4]b. Sometimes the involvement is seen as diffuse intimal thickening with mild affection of the adventitia [Figure 4]c. Localized disease is also often seen in children and there is always a sharp line of demarcation between normal and diseased segments [Figure 4]d. Superimposed calcification and atherosclerosis accentuates the vascular rigidity [Figure 5]; lesions in children are usually bereft of secondary atherosclerosis. When large and/or circumferential, these plaques contribute greatly to luminal stenosis or obliteration. These mainly affect the mid-thoracic level or the region of renal arterial origins [Figure 6]. Depending on the number and sizes of the intimal plaques, the aortic lumen may be irregular or obstructed [Figure 6]. The external diameter of the aorta is, however, the same or is slightly reduced. The exuberant adventitial and intimal fibrosis with consequent aorto-arterial stenosis/occlusion characterizes the pathology of TA, and these features are not seen with other types of LVV. Luminal occlusion results from superimposition of mural thrombus. Medial destruction results in not only vascular ectasia [Figure 5], but also frank aneurysms [Figure 7]a. The aneurysms (saccular or fusiform) occur in 2-6%, but usually co-exist with stenotic lesions; these are also uncommon in children. Aneurysms devoid of stenosis or pseudo-aneurysms are extremely rare, and so are dissections. 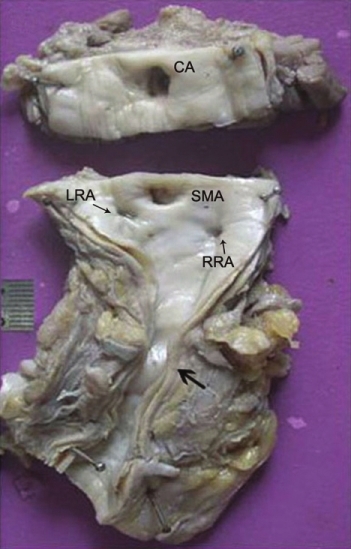 Dissections may not have acute presentations, are localized, usually affect the abdominal aorta, and at times are not grossly evident [Figure 7]b and c.
With branch involvement, the lesions are noted around the ostia. The subclavian (especially the left) and renal arteries are commonly affected. Rarely, all arch arteries can be involved [Figure 8]a. It was initially hypothesized that the disease began at the subclavian arteries, but a latest study shows that TA lesions mostly develop in a symmetric manner in paired vascular territories and are contiguous in the aorta. Pulmonary arterial involvement is found in about 70% of patients [Figure 8]b,  is usually mild, and can extend into segmental and sub-segmental branches [Figure 8]c. Therefore, some patients may have features related to pulmonary thromboembolism or hypertension. Coronary arterial involvement is usually rare, ostial, and/or proximal. It must be remembered that ascending aorta [Figure 9], pulmonary trunk and its branches, and coronary arteries can be affected in isolation. About 40% of patients develop cardiac abnormalities, manifesting as cardiac failure, seen often in children. The underlying basis for this in most cases is hypertension or ischemia of the hypertrophied myocardium. But not uncommonly, dilated, poorly contractile hearts with features akin to dilated cardiomyopathy occur, and a misdiagnosis of dilated cardiomyopathy is often made by those not familiar with this entity. Rarely, there can be organic aortic valvular involvement or ischemia/infarction related to stenosing or occlusive coronary arterial lesion. At times, there may be myocarditis or aortic valvular incompetence. In general, there is higher morbidity and mortality in children as compared to adults due to rapid development of hypertension and heart failure. A mortality of 10-30% has been reported on follow-up. With better treatment options now available, the prognosis appears to be improved. The mainstay of treatment is high-dose corticosteroids. Patients who do not respond to steroids or who have a relapse may need to be given methotrexate, azathioprine, or cyclophosphamide. Cyclosporine has been used as an alternative to cyclophosphamide. Tumor necrosis factor inhibition has also been used in relapsing disease or glucocorticoid-resistant cases. There are also interventional or surgical options available. , Balloon dilatation alone, stenting if required, and bypass grafting may be done, but the management requires a refined judgment because of the range of patho-anatomic and clinical issues involved. TA, a large vessel vasculitis in children, remains a fascinating and difficult disease characterized by constitutional features, hypertension, heart failure, and pulse loss. The pathological features vary with the stage of the disease and include granulomatous inflammation, elasophagia, adventitial and medial fibrosis, vessel dilatation, and stenosis or occlusions of the involved arteries. The clinical course of the disease is variable, with the active and quiescent phases, and treatment strategies need individualized management. 1. Jennette JC, Falk RJ, Bacon PA, Basu N, Cid MC, Ferrario F, et al. 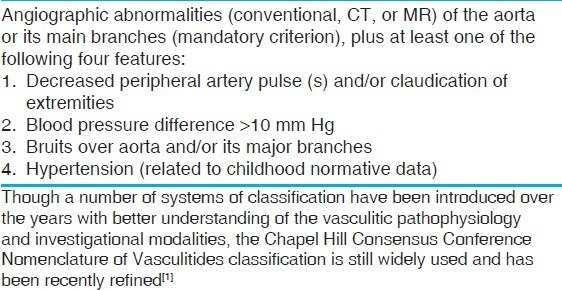 2012 revised international chapel hill consensus conference nomenclature of vasculitides. Arthritis Rheum 2013;65:1-11. 2. Ozen S, Ruperto N, Dillon MJ, Bagga A, Barron K, Davin JC, et al. EULAR/PRES endorsed consensus criteria for the classification of childhood vasculitis. Ann Rheum Dis 2006;65:936-41. 3. Luqmani R. Large vessel vasculitides: Update for the cardiologist. Curr Opin Cardiol 2012;27:578-84. 4. Weiss PF. Pediatric vasculitis. Pediatr Clin N Am 2012;59:407-23. 5. Richards BL, March L, Gabriel SE. Epidemiology of large-vessel vasculitides. Best Pract Res Clin Rheumatol 2010;24:871-3. 6. Kothari SS. Aetiopathogenesis of Takayasu's arteritis and BCG vaccination: The missing link. Med Hypotheses 1995;45:227-30. 7. 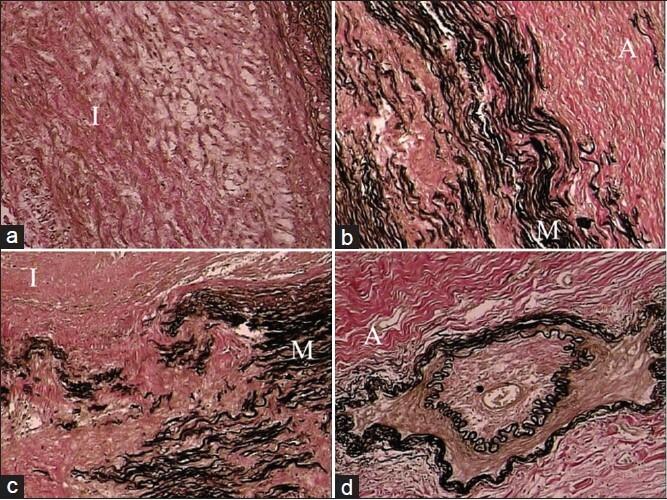 Al abrawi S, Fouillet-Desjonqueras M, David L, Barral X, Cochat P, Cimaz R. Takayasu arteritis in children. Pediatr Rheumatol Online J 2008;6:17. 8. Arnaud L, Haroche J, Mathian A, Gorochov G, Amoura Z. Pathogenesis of Takayasu's arteritis: A 2011 update. Autoimmun Rev 2011;11:61-7. 9. Miller DV, Maleszewski JJ. The pathology of large-vessel vasculitides. Clin Exp Rheumatol 2011;29:S92-8. 10. Brunner J, Feldman BM, Tyrrell PN, Kuemmerle-Descher JB, Zimmerhackl LB, Gassner I, et al. Takayasu arteritis in children and adolescents. Rheumatology 2010;49:1806-14. 11. Gornik HL, Creager MA. Aortitis. Circulation 2008;117:3039-51. 12. Stanley P, Roebuck D, Barboza A. Takayusu's arteritis in children. Tech Vasc Interven Radiol 2003;6:158-68. 13. Ozen S, Duzova A, Bakkaloglu A, Bilginer Y, Cil BE, Demircin M, et al. Takayasu arteritis in children: Preliminary experience with cyclophosphamide induction and corticosteroids followed by methotrexate. J Pediatr 2007;150:72-6. 14. 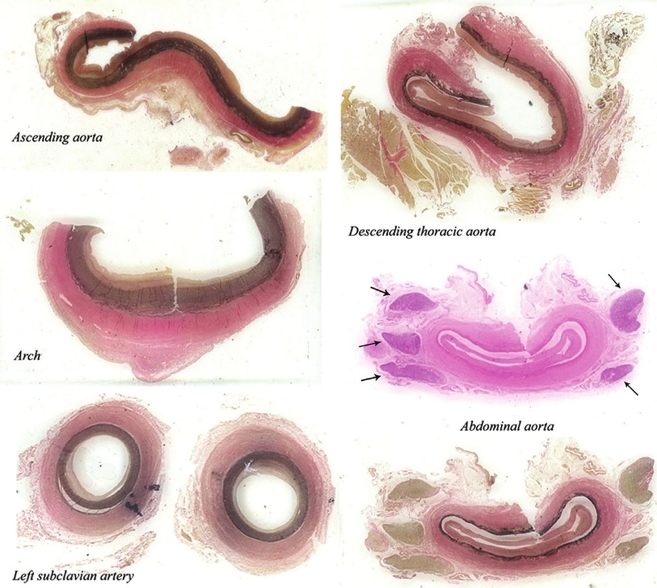 Muranjan MN, Bavdekar SB, More V, Deshmukh H, Tripathi M, Vaswani R. Study of Takayasu's arteritis in children: Clinical profile and management. J Postgrad Med 2000;46:3-8. 15. Jain S, Sharma N, Singh S, Bali HK, Kumar L, Sharma BK. Takayasu arteritis in children and young Indians. Int J Cardiol 2000;75:S153-7. 17. Walker M, Gallagher PJ. The surgical pathology of large vessel disease. Diagn Histopathol 2009;16:10-6. 18. Gulati A, Bagga A. Large vessel vasculitides. Pediatr Nephrol 2010;25:1037-48. 19. 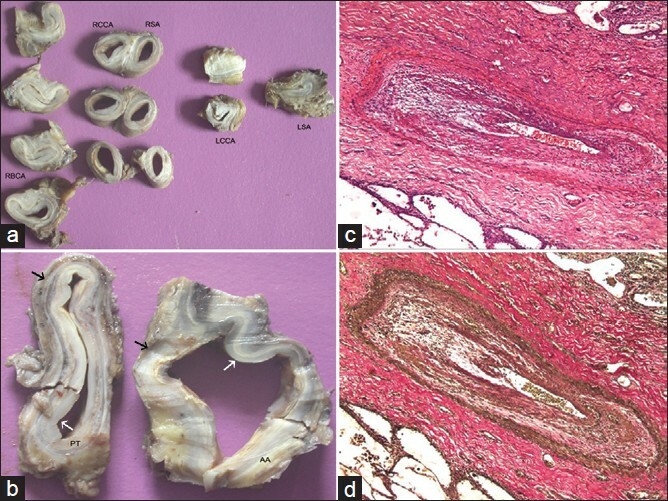 Hata A, Noda M, Moriwaki R, Numano F. Angiographic findings in Takayasu arteritis: New classification. Int J Cardiol 1996;54:S155-63. 20. Khalife T, Alsac JM, Lambert M, Messas E, Duong Van Huyen JP, Bruneval P, et al. 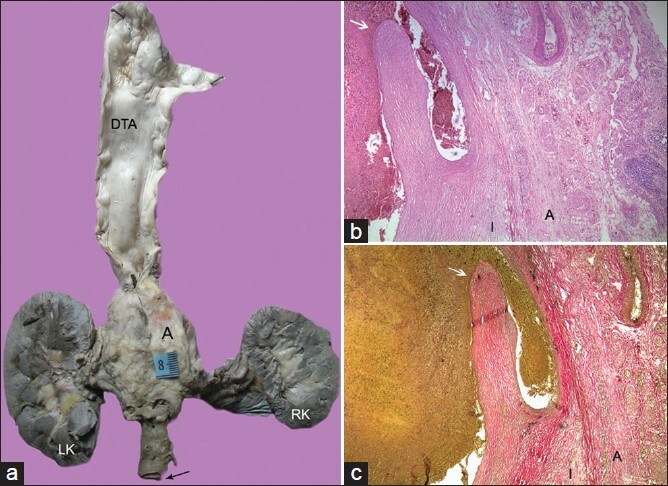 Diagnosis and surgical treatment of a takayasu disease on an abdominal aortic dissection. Ann Vasc Surg 2011;25:556.e1-5. 21. Arnaud L, Haroche J, Toledano D, Cacoub P, Mathian A, Costedoat-Chalumeau N, et al. Cluster analysis of arterial involvement in Takayasu arteritis reveals symmetric extension of the lesions in paired arterial beds. Arthritis Rheumat 2011;63:1136-40. 22. Toledano K, Guralnik L, Lorber A, Ofer A, Yigla M, Rozin A, et al. Pulmonary arteries involvement in Takayasu's arteritis: Two cases and literature review. Semin Arthritis Rheum 2011;41:461-70. 23. Lanjewar C, Kerkar P, Vaideeswar P, Pandit S. Isolated bilateral coronary ostial stenosis--an uncommon presentation of aortoarteritis. Int J Cardiol 2007;114:e126-8. 24. Kerr GS, Hallahan CW, Giordan J, Leavitt RY, Fauci AS, Rottem M, et al. 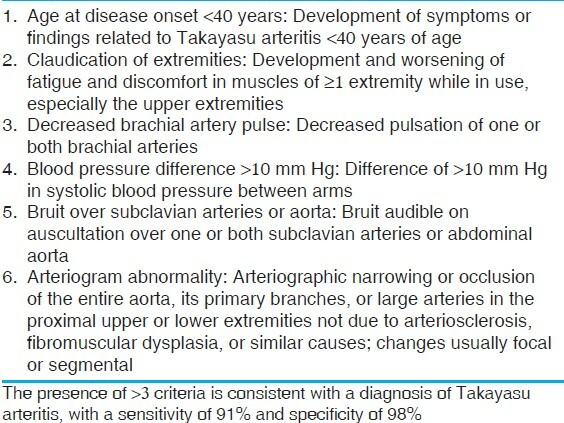 Takayasu arteritis. Ann Intern Med 1994;120:919-29. 25. Dagna L, Salvo F, Tiraboschi M, Bozzolo EP, Franchini S, Doglioni C, et al. Pentraxin-3 as a marker of disease activity in Takayasu's arteritis. Ann Intern Med 2011;155:425-33. 26. Kothari SS. Takaysau's arteritis in children - A review. Images Paediatr Cardiol 2001;3:4-23. 27. Reddy E, Robbs JV. Surgical management of Takayasu's arteritis in children and adolescents. Cardiovasc J Afr 2007;18:393-6. 28. Saxena A, Kothari SS, Sharma S, Juneja R, Srivastava S. Percutaneous transluminal angioplasty of the aorta in children with nonspecific aortoarteritis: Acute and follow-up results with special emphasis on left ventricular function. Catheter Cardiovasc Interv 2000;49:419-24.